After the feats of the submarine vessel, no feature of the present war has so much impressed itself upon American naval ob­servers as the effective use of the submarine mine. For both defensive and offensive use this deadly contrivance has proved its value beyond the expectations of those who had been its most active champions. As a result, the Navy Department at Wash­ington is making stren­uous efforts to get the full benefit of the lessons which have been taught in European waters during the last few months. From Secre­tary Daniels down to the midshipman at An­napolis, every naval officer has appreciated the fact that in case of war between the United States and a foreign na­tion, we shall have to depend to a great extent upon the protection af­forded by a thorough system of mines for the defense of our seaports and coast towns against the enemy's attacks. Along with the aero­plane, the submersible vessel, the steamboat, the telegraph, and the telephone, the submarine mine may be claimed as an American invention. David Bushnell, of Con­necticut, who built the first practicable under­water boat, the Ameri­can Turtle, also experi­mented with submerged mines. During the Rev­olutionary War, in December, 1777, he set adrift a number of keg torpedoes, attached to floating buoys, in the Delaware River above Philadelphia, where the enemy's fleet was lying; but, on account of the ice, and the resultant fact that the British ships had been towed in to the wharfs, his attack was a failure, the mines exploding without effect. 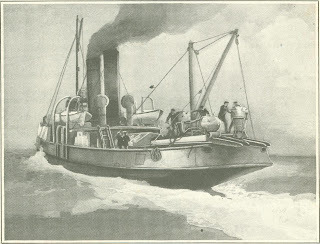 Though Bushnell's experiments proved un­successful, his theory that the bottom of a ship was especially vul­nerable to attack through the explosion of gunpowder under water, and his demonstration of the fact that mines for this purpose could be constructed and discharged, bore fruit in time. Nearly twenty years later, Robert Fulton, best known as the builder of the Clermont, took up his predecessor's idea. Failing to receive sup­port from the American government, he attempted to introduce this method of war­fare in France. In. August, 1801, he blew up a small vessel in the harbor of Brest with a mine filled with twenty pounds of gunpowder, which he attached to the ves­sel's bottom by means of a submarine boat of his own invention. At the time, according to Admiral Le Pelly, "conscientious scruples against the use of such a terrible weapon" prevented the French government from adopting Fulton's plans. He had urged that he and his crew should be recognized as legiti­mate belligerents, and should have regular commissions issued to them; but his re­quest was refused by the French govern­ment on the ground that his method of des­troying the enemy's fleets was contrary to the dictates of humanity. Failing to receive support in France, Fulton turned to England, but again his plans failed. On October 15, 1805 - just six days before the battle of Trafalgar - he blew up the brig Dorothea before a number of spectators, among whom were members of the Admiralty and naval officers of high rank. He had received the backing of England's great statesman, Pitt, but the British naval authorities felt that it was a mistake to recognize a mode of warfare which the power commanding the sea did not need, and which, should it prove suc­cessful, might deprive them of their existing supremacy. Fulton then returned to America, where he again failed, mainly through the opposi­tion of Commodore Rodgers, who placed every obstacle in his way, refusing to countenance a method through which the supremacy of the fighting ship might dis­appear before an insignificant piece of mechanism. From that time on frequent experiments were made, both in Europe and America, but there was no marked advance in the operation of mines until Samuel Colt, in 1842, demonstrated the fact that they could be successfully exploded through the use of electricity. His invention of the submarine cable made this possible, and though he was never able to see his device used in active warfare, his theory is responsible for the present system of mines such as are employed to protect practically every important harbor in time of war. Although electrical mines were used by the Russians during the Crimean War, and served as an effective defense for some of their ports, it was not until our own con­flict between the North and the South that the submarine mine came into its own. The Confederates made extensive use of "in­fernal machines," as they were called, in order to hamper the operations of the Union gunboats that were attacking their harbors, blockading their coast, and ascend­ing their rivers. They employed contact mines designed to explode through the use of an ordinary friction primer, mechanical mines floated down streams in beer-barrels, and electrical contrivances carrying more than a ton of powder. The actual results achieved, however, were not great, the sinking of the Commodore Jones being the only loss of any importance inflicted on the Federal naval forces. In more recent warfare, the submarine mine first came into successful use in 1904, when Russia and Japan entered their con­test. Much mystery was thrown about the loss of the Japanese battle-ships Hatsuse and Yashima in the Yellow Sea, but after the war ended it was learned that these two vessels, among the finest in the Japanese navy, had fallen victim to Russian mines. On almost the same day the Russian flag-ship Petropavlovsk went to the bottom off Port Arthur, taking with her Admiral Makaroff, one of the highest officers of the Czar's navy. She is said to have been destroyed by two mines ex­ploding simultaneously, which had been laid by a Japanese torpedo-boat the night before. Under the American sys­tem, the responsibility for submarine mines is divided between the army and the navy. The Coast Artillery Corps has charge of the defense of our harbors, handling this by a system of so-called "observation" mines, which may be exploded either by an observer stationed on shore or by contact with an attacking vessel. Through a simple electrical contrivance they may be rendered innocuous to friendly vessels, though deadly to those of the enemy. The navy, on the other hand, has charge of mines to be laid in case of emergen­cies, to protect our fleet while awaiting action, or to endanger the vessels of the enemy and force them into a disadvantageous position. Equally important from the naval stand­point, and specially emphasized by the lessons of the present war, come the or­ganization of a special fleet charged with picking up the mines of the enemy. The importance of this work cannot be illus­trated better than through the fact that within three months after the opening of the European war England is understood to have organized a fleet of mine-sweepers comprising more than a thousand vessels and covering the whole eastern and south­ern coasts of the British Islands. Nevertheless, scores of British and neutral mer­chantmen, as well as a few war-ships, have been sent to the bottom by German mines that have escaped the vigilance of the naval vessels and the subsidiary “trawler sec­tion" of the Royal Naval Reserve. At the present time the American navy is prac­tically without such means of defense, but steps are being taken to remedy this defect, and it is practically certain that Congress will be asked for legislation along lines similar to those upon which the English system is based. To come to the actual construction of the mines themselves, they may be divided into two classes, floating and anchored. Strange to say, a floating mine, if released from its buoy, will sink to the bottom, while the anchored mine is buoyant, being held from drifting by its anchor. 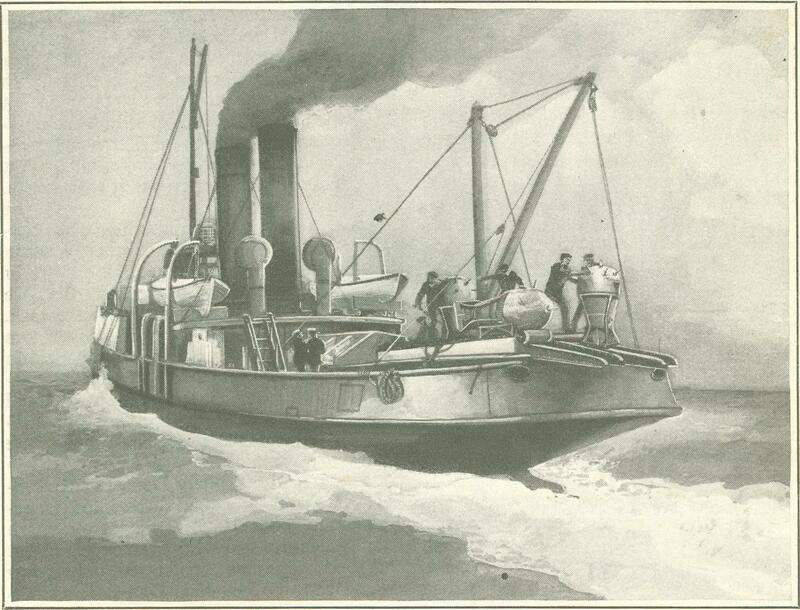 While the floating mine is undoubtedly of great value, it has seen comparatively little use in the European war. 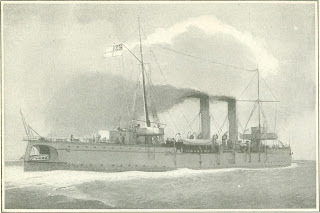 The three British and French battle-ships destroyed when the fleet of the Allies first attempted to penetrate the Dardanelles were victims of mines of this type. The use of floating mines; however, is strictly limited under the terms of the Hague Convention, it being re­quired that they shall be absolutely harm­less one hour after leaving the boat or vessel from which they have been cast. In the same way, for the protection of neutral vessels, the international code provides that all anchored mines must become innocuous as soon as they break adrift from their anchor. Floating mines can be used to advantage only where there is a strong current, as in the case of the Dardanelles, to carry them down upon the enemy's ships, or when thrown from a retreating fleet with the hope of carrying destruction to its pursuers. In such cases the mines are generally thrown overboard buoyed by an old cracker-box or barrel, a log, or some equally harmless object; but the commander of a pursuing vessel would indeed be foolhardy to allow his cutwater to strike any such floating object, which might easily carry with it a deadly engine of destruction. A standard and widely known type of anchored mine is the Vickers, which is made in different sizes, and carries from seventy-five to five hundred pounds of an extremely high explosive. As a rule, it is so anchored as to remain about fifteen feet below the surface of the water, thus ex­ploding its charge against the unarmored portion of a war-ship's hull. The method by which it is sunk to this depth is both ingenious and simple, though I shall have to take a good many words to make it clear to the reader. The mine, the anchor, and what is known as a measuring-weight are thrown into the water together. The measuring-weight, which is fastened to the anchor by a fifteen-foot length of rope, is a small ball of lead, which plunges rapidly toward the bottom. The anchor is a much larger, box-shaped object, which sinks more slowly owing to the resistance of the water. It will be seen that when the weight is fifteen feet below the anchor, the two will move downward together, the former hanging from the lat­ter by the rope that fastens them. 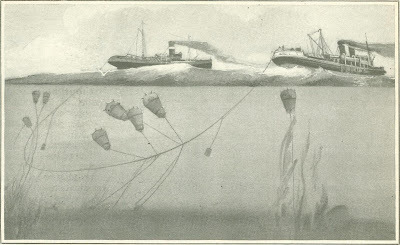 Meanwhile, the buoyant mine floats on the surface, being attached to the anchor by a cable which pays out from a reel as anchor and weight sink. The weight reaches the bottom first. As it does so, the cessation of its pull automatically stops the reel, which is inside the anchor. The cable will now pay out no farther, and as the anchor sinks the remaining fifteen feet to its final position on the sea-floor, it pulls the mine just that distance below the surf ace. An anchored mine of this type is usually exploded by the action of a contact arm, which strikes the passing ship; or its rotary motion, as it rubs against the side of a vessel, may disengage the firing-plunger. In case the mine breaks loose from its anchor, the relaxation of the strain that is caused by its buoyancy locks the plunger in such a way as to render the mechanism harmless to a vessel striking it. The cost of such a mine may be roughly estimated at five dollars a pound, exclusive of the explosive. The average type is about three feet in diameter, weighs about one thousand pounds, and carries from one hun­dred and fifty to two hundred pounds of guncotton, or some other high explosive. Effectively exploded, it is powerful enough to disable, and most probably to sink, the largest battle-ship afloat. The German navy is under­stood to have adopted as its favorite weapon an electro-chemical mine charged with an explosive known as "T. N. T.," or trotyl. On the top of this con­trivance, are a number of spines. These are made of extremely soft metal, and contact with a vessel's side would cause them to bend. Closely fitting the interior of each spine is a delicate glass tube. As soon as the spine bends, the glass breaks, allowing a fluid to escape. Directly beneath is an electrical battery, complete save for the liquid element. This, pouring from the broken tube upon the electrodes, generates a current which immediately explodes the mine. Under the head of defense against submarine mines, the aeroplane has proven itself most useful. To the lay­man it seems strange that a naval ob­server in an air-craft five hundred or a thousand feet above the water can see far more clearly beneath the waves than if he was on the deck of a vessel, within a few feet of the sea. This is explained by the fact that when the eye is far enough above the surface to lose sight of the motion of the waves, and to make the face of the ocean appear absolutely flat, the vision can then penetrate the water. For this reason, in locating the enemy's mine-fields, scouting aeroplanes are used, which search for the point of danger and report back to the mine-sweepers. Special apparatus has recently been con­structed for mine-sweepers, but hitherto most of the work has been done by small steamers or trawlers, which operate in pairs. Between these vessels is stretched a long cable, suspended from them in such a way that it moves forward a short distance above the bottom of the sea. As it sweeps along, it picks up the anchor-lines of the mines and drags the destructive engines to the surface, where they may be picked up or exploded with little danger. Working in relays, and following one another exactly as street-sweepers do on a public thorough-fare, a few pairs of boats can clear a large area during a day. In the United States the ques­tion of submarine mines is one to which the Navy Department is now paying great attention. At the present time each of our battle-ships and larger cruisers is equipped with a small number of submarine mines, both of the anchored variety, to be used for de­fense when our fleet is awaiting action, and of the floating type, for offensive work. A country with a comparatively limit­ed coast-line can use the submarine mine for defensive work so as practical­ly to prevent the entrance of hostile vessels to her harbors, but this cannot be done in the United States. With our continental coastline running from Eastport, Maine, past the Florida peninsula and around the Gulf of Mex­ico to Brownsville, Texas; with our long frontage upon the Pacific; with the hundreds of points at any one of which an enemy might strike, the number of mines needed for even a compara­tive degree of protection would mount far into the hundreds of thousands. Their cost would be enormous, and their lay­ing and manipulation would require a force of men far greater than we could assign to the task. Only trained operators and men with a certain amount of electro-me­chanical knowledge could be used for this work, and not one hundredth part of the necessary number are likely to be available. During the last two years unprecedented prog­ress has been made in the expansion of our mining equipment. This was begun and was well under way before the last Congress met. The navy is not, as many suppose, charged with the mining of our harbors. That is a function of the army. The extent of the mining operations of the navy is confined to the immediate vicinity of the fleets and such mining as may be necessary on the high seas. For the execution of this work and a further study and development of mines and mining, the navy now has three ships—the San Francisco and Balti­more, mine-layers and mine-depot ships, and the Dubuque, mine train­ing-ship. The general board as early as 1908 recognized the need of mine-depot vessels, and recommended the con­version of two old cruisers for this purpose. The same year, Congress authorized the conversion of the San Francisco and Baltimore. Work was started on the San Francisco June 12, 1908, but was not completed until De­cember 2, 1911. Work on the Balti­more was not started until April 5, 1913, and was completed April 1, 1915. As to mine-sweepers, a division of seagoing tugs and a division of torpedo boats have recently been equipped with mine-sweeping gear, and the destroyer tender carries mine­sweeping gear for a division of des­troyers operating with the fleet. Ad­ditional gear is now being supplied. At Pensacola, Florida, during the winter, the San Francisco and a sub­ marine flotilla have been operating jointly in mining exercises. The department has begun the manufacture of mines, and in a short time will have thirty-one mines for every nine it had two years ago, in­creasing our stock two hundred and forty-four per cent. The modern naval officer realizes that the submarine vessel, the sub­marine mine, and the aeroplane are factors that have changed almost every phase of modern warfare. The old-line officer brought up with the idea that heavy armor on a battle-ship and powerful guns were bound to drive the enemy from the seas, is not obsolete. There are still men of this type in the navy, but the younger men, who are able to assimilate new ideas, are rapidly coming forward, and in them lies the greatest hope for America along naval lines. In the matter of harbor pro­tection - which, as has been stated, comes under the jurisdiction of the Coast Artillery Corps - mines alone would be insuffi­cient. An invading enemy might send in advance of his fleet a number of useless hulks to explode defensive works of this type. To prevent this, there is need of competent batteries of rapid-fire guns, probably from three to six inches in caliber, in order that the assailant's advance guard may be sunk before it has in­vaded the mine zone. Such guns, while com­paratively useless against a battleship, would be adequate for the destruction of un­armored vessels. In this respect our harbor de­fenses at the present time are inadequately provided. Many of our more important seaports are protected by heavy mortar batteries and rifles of modern type, but the secondary bat­teries in some cases are totally absent and in all instances need strengthening. For this system of harbor defense electrical submarine mines are generally considered the most efficient. They are always under control, and fresh mines may readily be added to re­place those which have been exploded. No ves­sel can pass through a channel so protected without affording a means of ascertaining her presence. The per­fect electrical condition of such mines may be easily ascertained, by a system of tests from the shore; and the mines can readily be raised for examination, or recov­ered when no longer required. To counterbalance these advantages, the objections to this type consist in the number of wires, enclosed in sub­marine cables, that must be used, and the need of a large number of spe­cially trained men for their manipulation. In closing, it should be said that a submarine mine is not always in­fallible, for even with the most up-to-date type, vessels may strike these engines of warfare and still remain uninjured. An instance was recently re­ported when an English submarine vessel picked up the cable of an anchored mine in one of her steering-vanes. Stopped by this sudden obstruction, and not knowing what had been encountered, the boat rose to the surface, carrying with it the mine, anchor, and all. It was only after several hours of most difficult and dangerous work that the mine was cast adrift. Had the submarine been ten feet closer to the sur­face, she would undoubtedly have been destroyed with all on board. Another instance took place during the Spanish American War, in the harbor of Guantanamo. The old battleship Texas - since renamed the San Marcos, and used as a trial target for heavy naval guns - picked up a Spanish mine with her propeller. If this had happened in the colder seas of the north, it is tolerably certain that the ship would have been sunk. To the warmth of the Cuban waters must be ascribed her escape. On that coast barnacles grow as freely as weeds in a garden. The Spanish mine was of a type, now obsolete, with pro­truding spines which, if pressed in, acted as firing-pins to ignite the charge. Barnacles, however, had so incrusted these plungers that even when struck by the propeller of the Texas they remained in their original position, and the mine, firmly fixed between the propeller-blades, was removed without exploding. While submarine mines have been used for nearly one hundred and forty years in the warfare of nations, they are even yet more or less of an unknown quantity. To the layman, their use is perhaps the least, understood of all the arts of war. While its main points and theories are known to all nations, there are many "state secrets," jealously guarded and concealed. For this reason, even experienced officers are often embarrassed for lack of informa­tion concerning some technical points of the various systems that are used. Each of the leading European powers has its own special methods and devices, which it guards with the utmost care. In the United States our army and navy officers have ideas which they believe and hope are in advance of those in vogue in Europe; but they are frank to say that, not knowing the complete scope of the foreign practice, they can make no definite comparison. Originally published in Munsey’s Magazine in July of 1915.